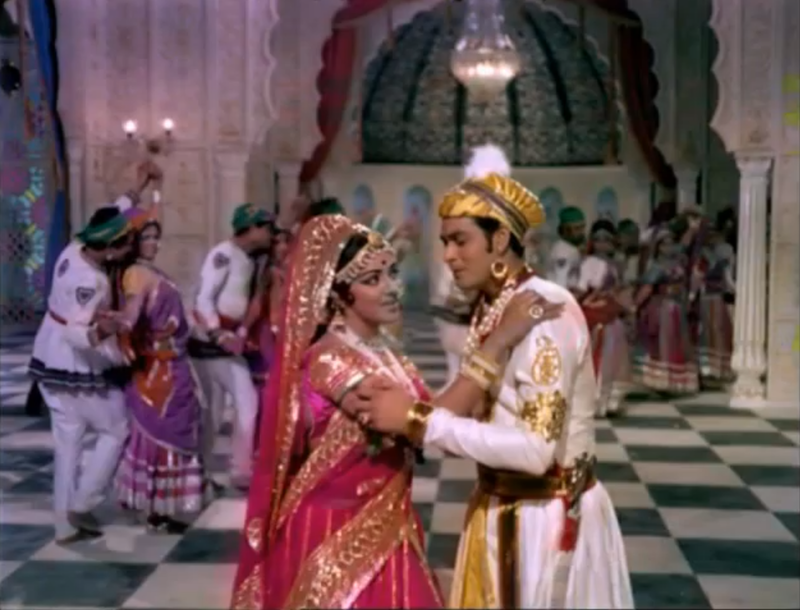 The first Hindi film I ever watched, Fanaa, had a lovely number in the middle entitled: "Dekho Na" or "Look Now and See." 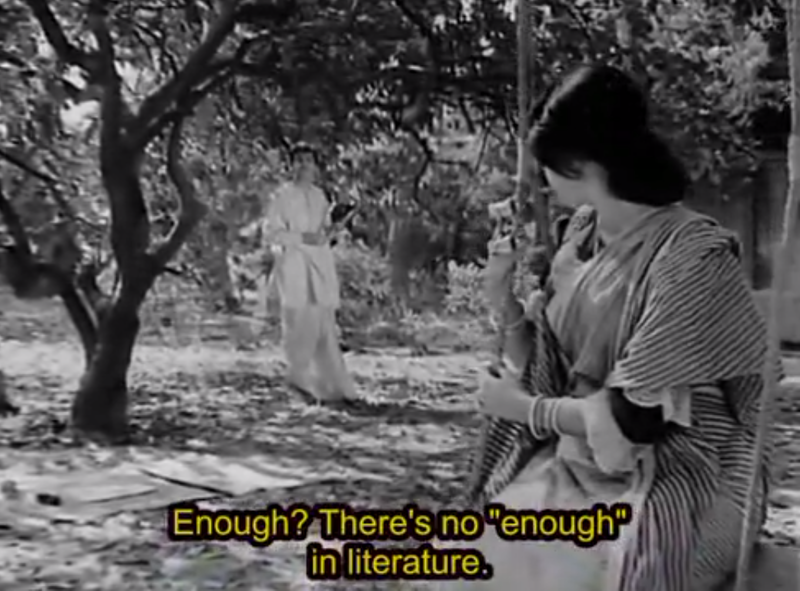 Of course, it's meant as a stroke of poetic-irony because the heroine CAN'T see, at least not in the literal sense. 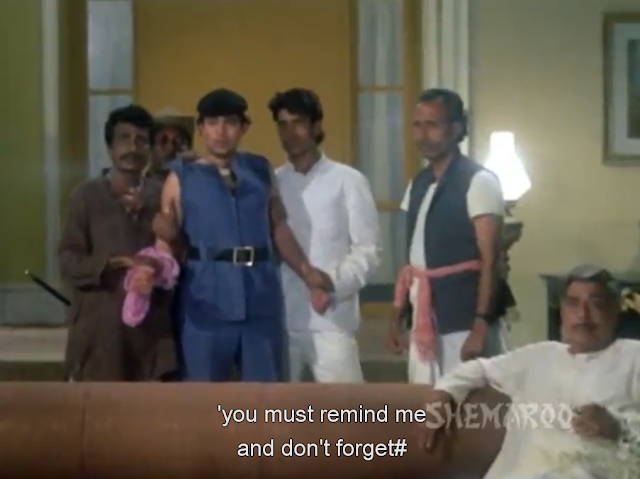 "Dekho" was one of the first Hindi words I learned to pick out, and man, does it get dropped a lot. (Along with "Suniye," or "Suno," a polite request to "listen.") 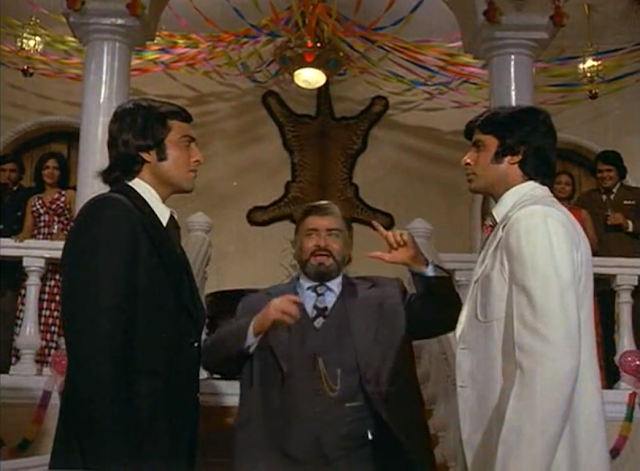 Obviously, looking and listening are pretty important in Hindi films, and also happen to be the most important job of the viewer . . . so I'm not surprised that those requests/demands stand out to me. However, there's a lot of other layers of significance to looking in filmi stories. Not just "a look" in the singular (which is obviously crucial as well), but the act of looking itself. For instance, one could argue that a look of desire is a passive kind of looking. Not so much an act, as a state of being. It's important, but it doesn't necessarily immediately achieve an end, other than to potentially give the object of one's desire fair warning! Here I'll count down my top five "Acts of Looking" upon which the wheels of the plot turn. 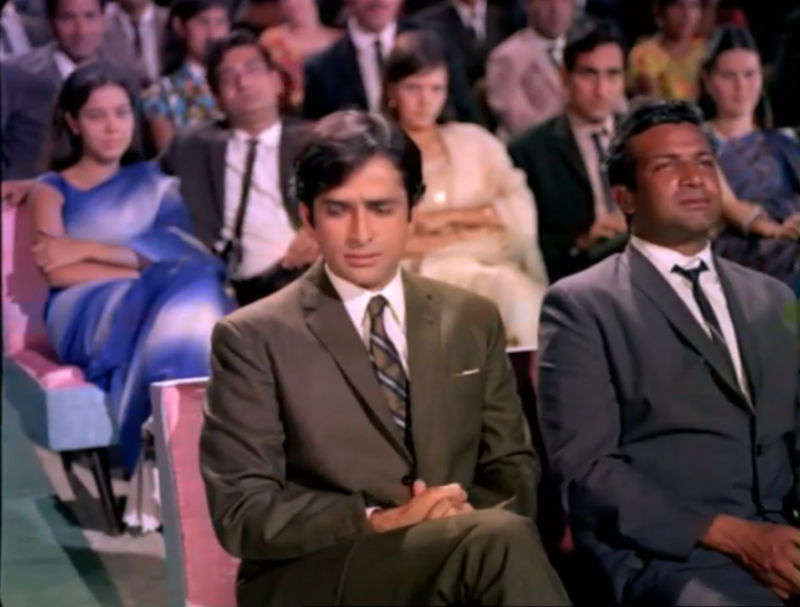 When one person won't look at another in a Hindi film, it's surely a sign of deep disappointment, guilt, or maidenly shyness. And you can also be sure that it signifies a soon-to-be ESCALATION of EVENTS. The disappointed person will probably seek out full-fledged punishment of the other person for misdeeds. 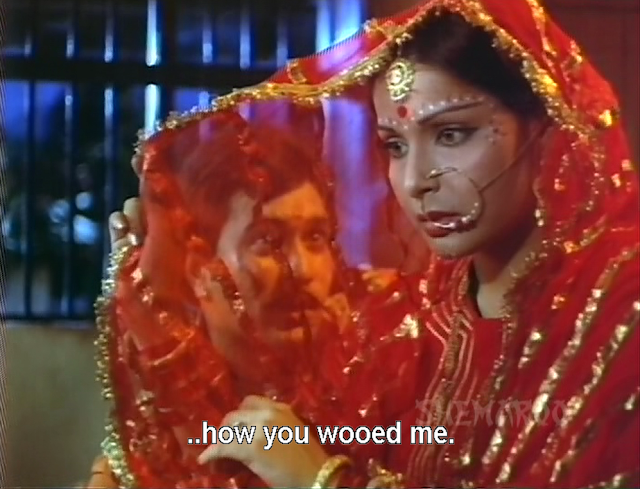 And the guilty may madly grasp for some sort of redemption . . .
. . . or a fatalistically tumble towards self-destruction, Devdas-style. This is THE most important mark of soulmates--be they brothers, friends, or lovers--that they know each other's thoughts with a look. Nothing really needs to be voiced or even sung. They just know. In fact, this paragraph itself is already too long. Moving on. This is one of the most bone-chilling of all looks--the look of silent accusation by the close friend, lover, or family member. This usually happens when a loved one has committed an act of betrayal, or has at least proved "worthy" of suspicion. When this look happens, beware. Warranted or not, justified accusation or no--violence and/or death and/or imprisonment probably will soon follow. 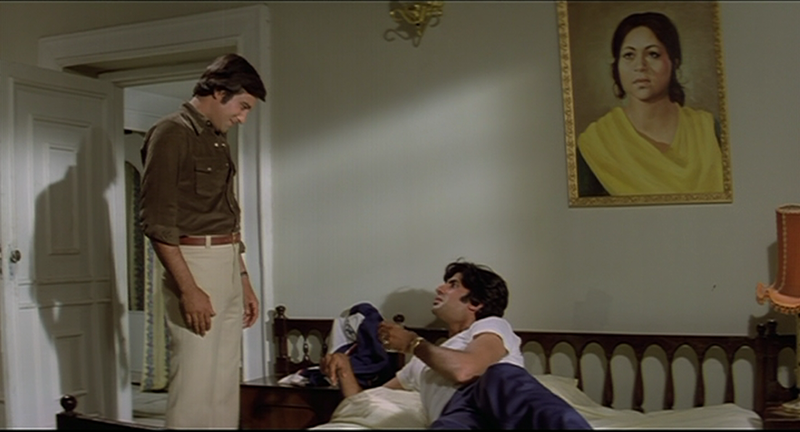 This is a crucial moment in the filmi-romance of course. A gentleman is (usually) distinguished from the goonda by his restraint, after all. However, this type of looking reaches even greater heights of significance in the Dacoit Drama. When an outlaw chooses to suppress his natural urge to steal and take whatever and whoever he wants, you know he's been transformed somehow. When he wants the woman, yet walks away instead of throwing her over the back of his horse, you suddenly know he has changed his ways. Which probably also spells his demise (dacoits make too many enemies to give up the saddle and rifle safely), but that's OK. 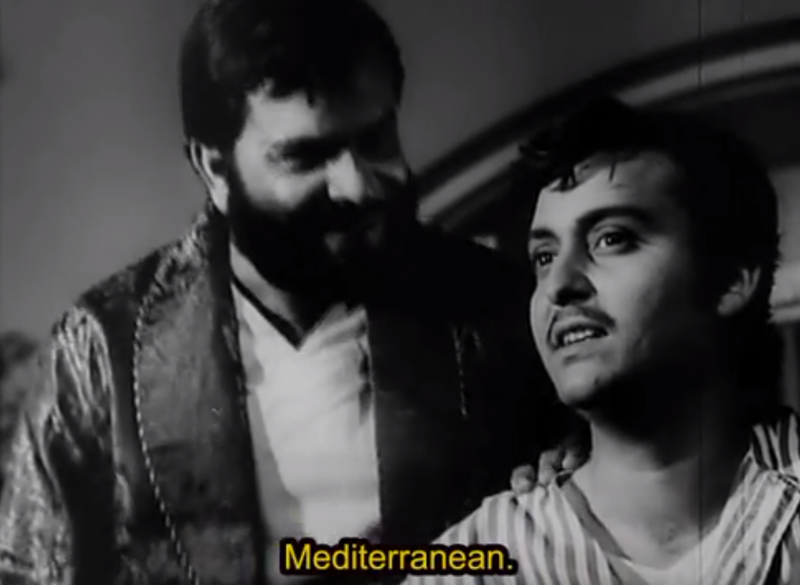 Better to reform and die than transgress and live, at least, so the Bollywood mythos tells me. 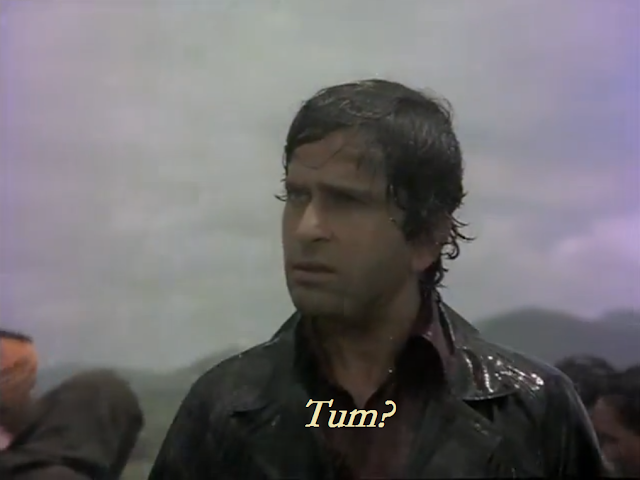 Perhaps the most essential part of filmi-grammer is the Big Reveal. Whether it's the discovery of a long lost sibling/parent, or the realization that someone long hated never deserved one's enmity, or the sudden grasp of true worth in a person one mistreated . . .this act of looking--the look of realization--is my ultimate favorite. It means that no matter what else happens in the last five minutes, you can go to bed with some little satisfaction, some resolve to an old injustice or injury or misunderstanding. What "Looks" do you love? What significant acts of looking did I leave out? 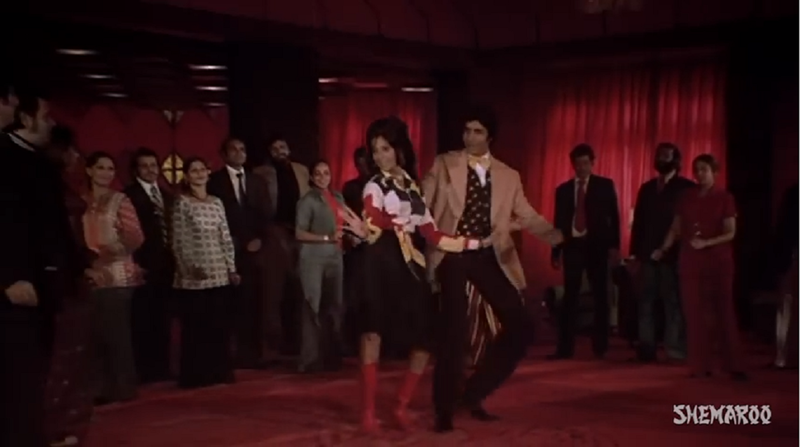 Whenever I watch a later 70's movie, I love that I can usually depend on a ridiculously awesome song/dance number appearing out of the blue (or the red or the gold) . . . something with crazy lighting or costumes or even masks. 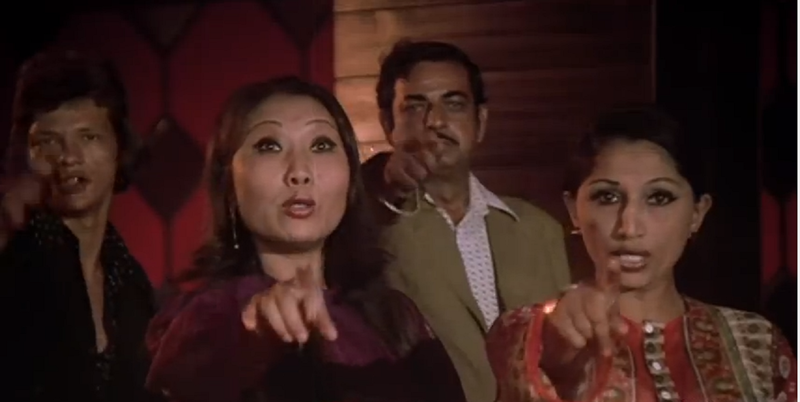 So, to go along with the gushy review of last week, a RAD/FAB number from Don (1978): Main Hoon Don. Note: I first thought that the soundtrack of Don was a little forgettable. That was, until I woke up a couple of mornings with "Main Hoon Don" running through my head. 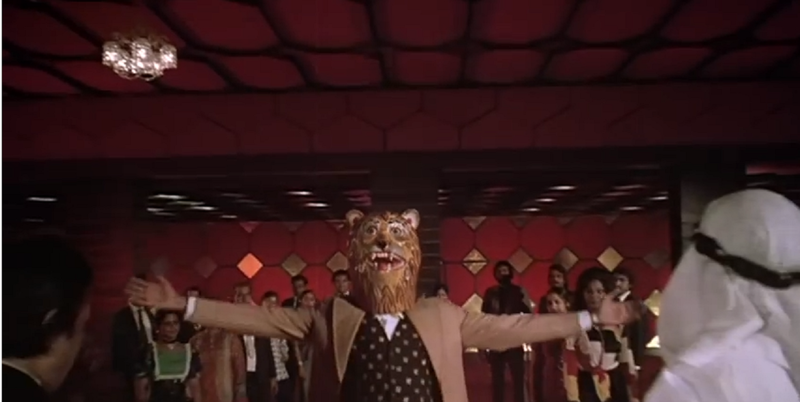 And yes, there's a tiger mask in this scene. Why? I don't know. But it is RAD/FAB and catchy--so I am now stamping it with my approval. Sometimes an artist's worst detractors are the people he or she loves the most. So much so, that a choice may be required: Love or Art? In the overlooked L. M. Montgomery classic , "Emily's Quest," (1927), the young protagonist and aspiring writer's beloved work is given a harsh review by her respected idol: the much older, well-traveled, cynical, and overly-cultured Dean Priest. Emily feels like she did when she was informed her father had died. Seeing the change in her, her friend goes further instead of shutting up or couching his statement. 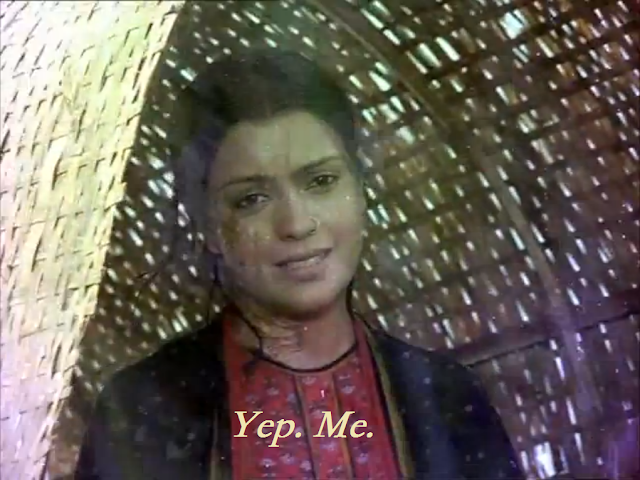 Dean asks her if she's being fair. The funeral becomes more literal when Emily flies into a fit of despair and burns her manuscript in the stove. "Repentance seized upon her. Oh, why had she done it? Why had she burned her book? Suppose it was no good? Still, it was hers. It was wicked to have burned it. She had destroyed something incalculably precious to her. What did the mothers of old feel when their children had passed through the fire to Moloch--when the sacrificial impulse and excitement had gone? Emily thought she knew." What Emily doesn't know is that Dean has lied. He actually thinks her story is exceptional. But it's something he sees as standing between him and Emily. Perhaps he's right about this, for after the book burning, Emily has a near fatal accident, and becomes even less herself, giving up writing entirely, which gives Dean even more room to make his move. Of course, Emily eventually realizes she isn't herself in the relationship, even though she hasn't known herself for a while. Spurred by her breaking of the engagement, Dean reveals all. 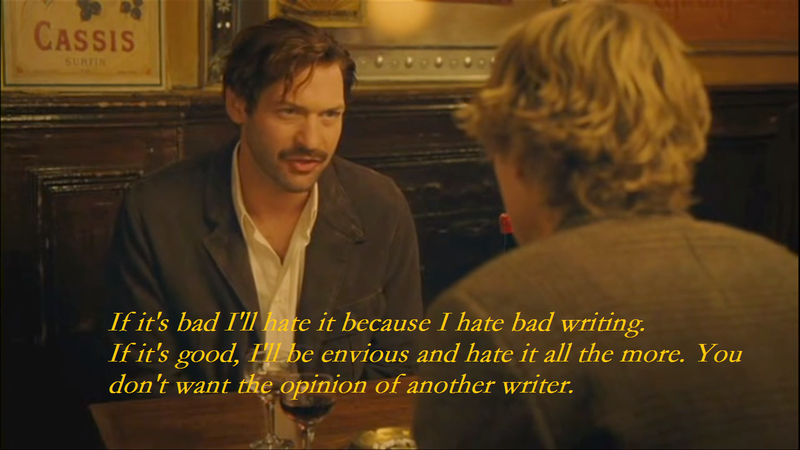 That he was jealous of her writing, as it took her away from him. That he had wanted her all to himself. As much as he loved their relationship of ideas and respected her as an artist, he couldn't get past the fact that she would always belong to her writing more than she belonged to him. This releases the poison from an old wound for Emily and helps her to move on. But it was still too late for her beloved little story, and for all the stories that might have come during the months stolen from her. I've always found this part of Emily's tale heartbreakingly realistic, and I couldn't help but see shades of it in "Charulata" (1964) and "Abhinetri" (1970). 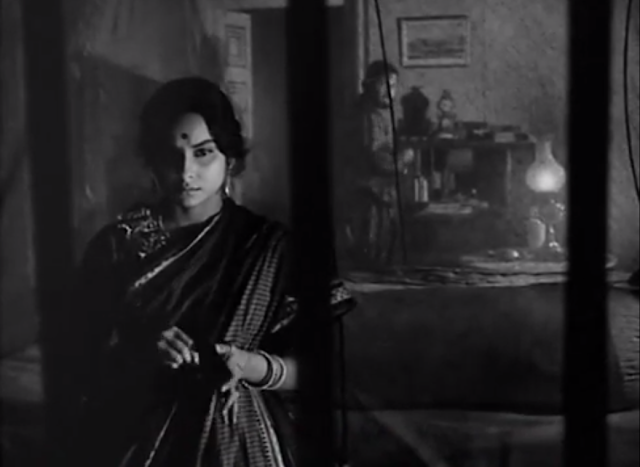 The titular character of Satyajit Ray's "Charulata" (1964), is a pretty early and progressive Indian depiction of a female writer, or rather, "A Woman Who Wrote Once." 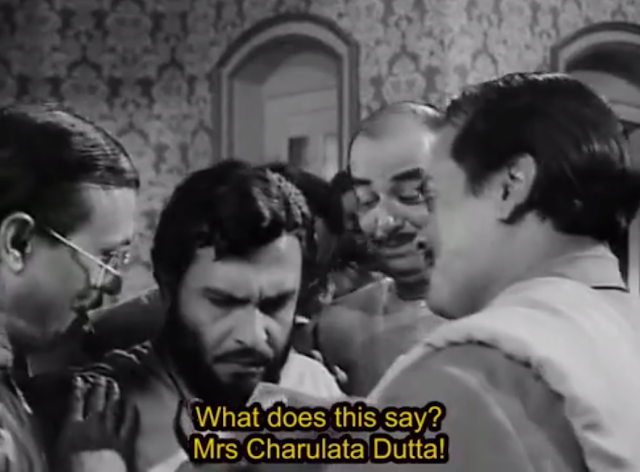 Charulata is a bored upper-class, late 19th century Bengali woman, doomed to wander the rooms of her mansion waiting for her husband to stop spending all his time on his burgeoning political newspaper. Charulata is too intelligent and curious to survive in such a state for long, especially after she's read all the Bengali books in the house from cover to cover and embroidered every inch of the place. So naturally, her husband asks his indolent and hyper-educated brother to come up to town and spend some time with his lonely wife. Like Emily, Charulata can't quite seem to get away from other people's opinions about her art. But in this case, excellence in art itself doesn't seem to be the ultimate goal. 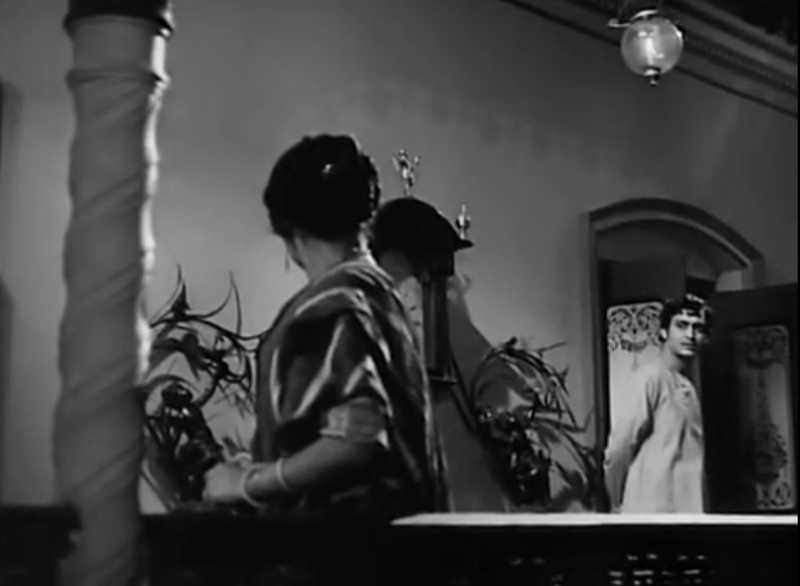 Charulata's art appears at a suspicious time (not to be confused with the common "auspicious" time in Indian films) . 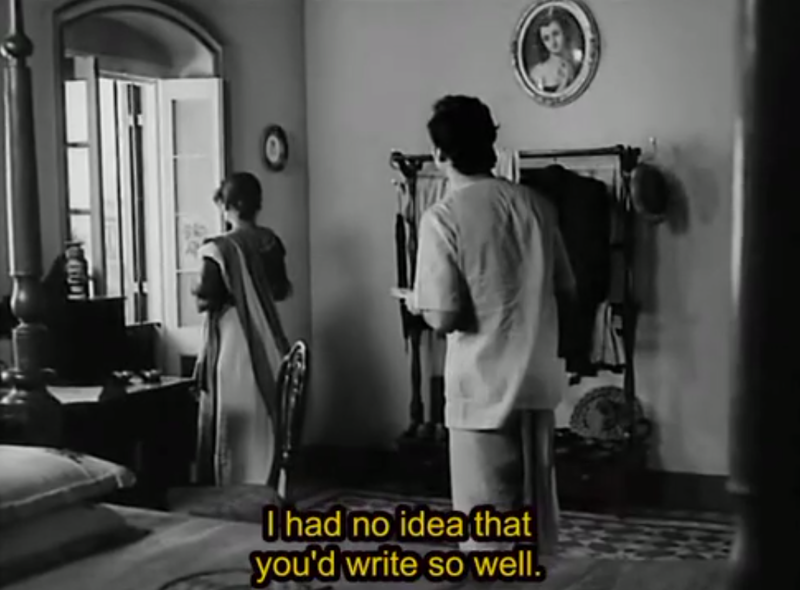 . .
Charulata only starts writing when she feels the need to prove something to a very particular someone. . . who's providing her with languidly stimulating conversations about literature and music. Yep. You guessed it. Brother-in-law. True, brother-in-law. Although I don't know if you personally are adding much. Yeah. I don't really get it. But, OK.
Well, THAT I can get on board with. Although the film might be telling us that she writes because she feels an emptiness from her lack of motherhood and a new family of her own. 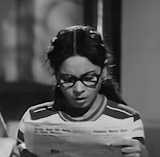 As soon as Charulata does sit down and write, she immediately achieves massive success. But somehow this isn't enough. She'd rather watch brother-in-law from every conceivable angle in the atrium and and play passive aggressive mind-games with him. She doesn't seem to be interested in writing anymore. Perhaps because it didn't get her what she wanted? (Praise? Mutual fascination? Love? It's unclear). 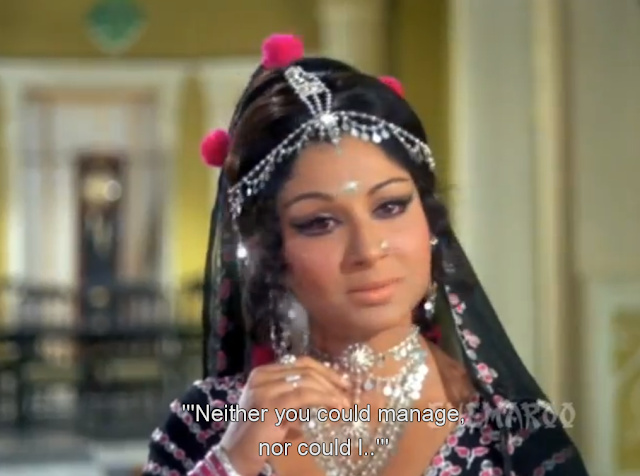 Unlike Charulata, the heroine of "Abhinetri" (1970) seems quite attached to her art. Yet still not attached enough to fight for it above all else. 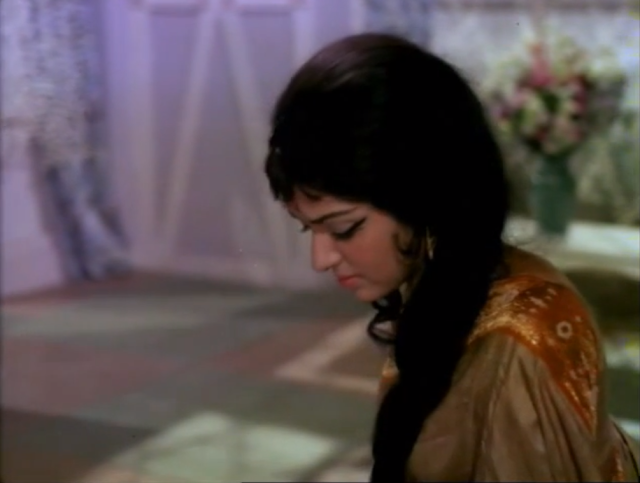 To me, Abhinetri feels like one of the rash of "A Star is Born" reminiscent Hindi movies released in the 60's and 70's. Basically, the plot revolves around one member of a romantic duo (usually the woman) who is enjoying increasing success in films or dance or some such public display-oriented art form, and invariably, the other member of the jodi becomes increasingly jealous and/or angry and/or despondent about this fact. Eventually, the person (read = woman) usually has to give up art for the sake of love. Yes. 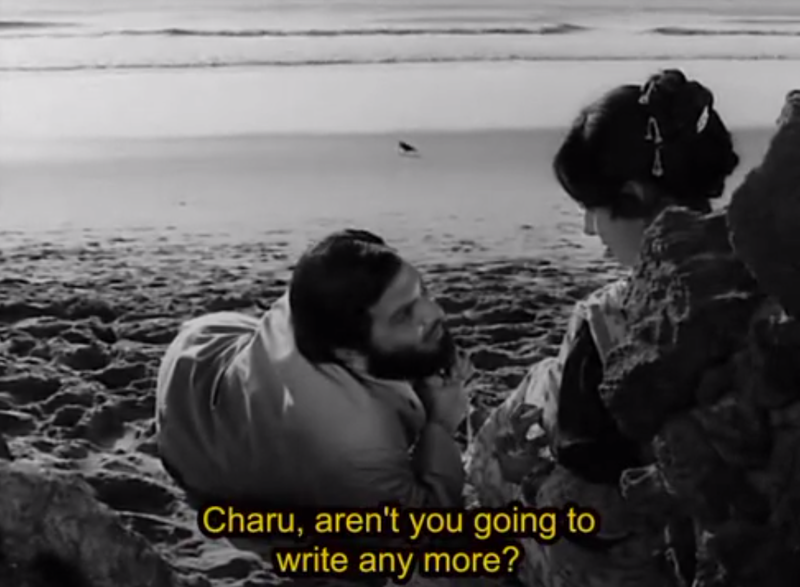 But it's far too early in the film for that to happen. 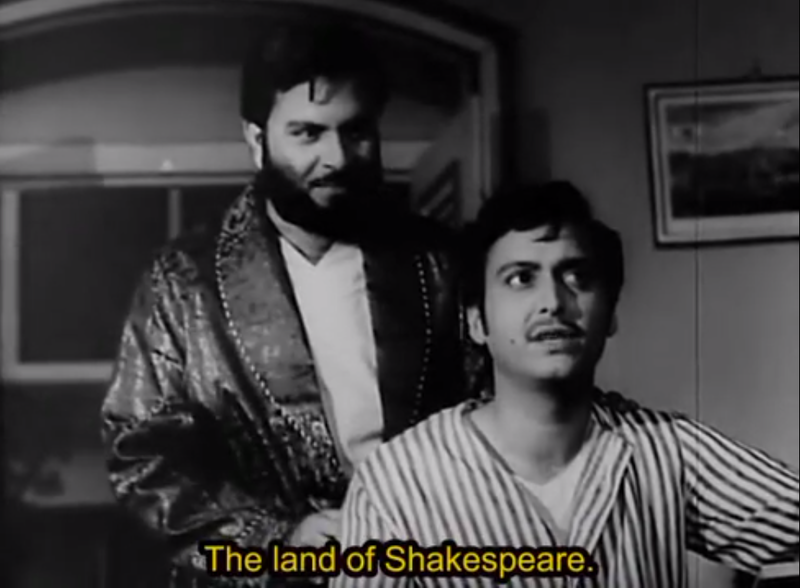 Aren't you paying attention to your filmi pacing? But this is A Star Is Born-lite, because nobody dies or walks into the scary ocean in the dead of night, and the young married couple aren't peers in the same career. 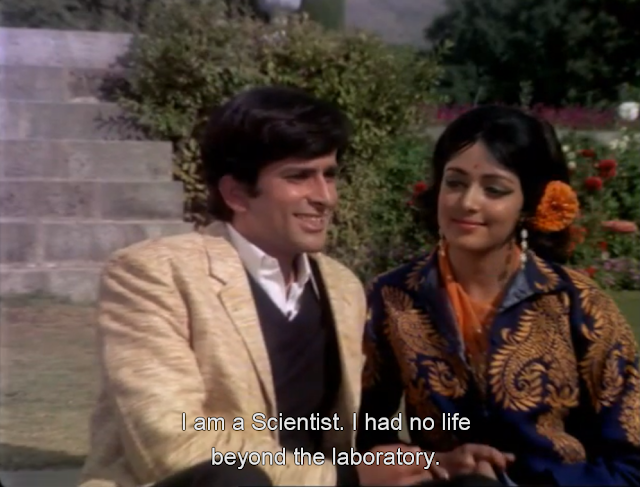 Shashi's character (Shekar) is a scientist, and Hema's (Anjana) a popular stage dancer. She's pretty dedicated, too. They meet, marry quickly, and then alternately squabble, snuggle, and separate during the rest of the film. First clue that he might not have it all together, dear. However, your coat REALLY does. 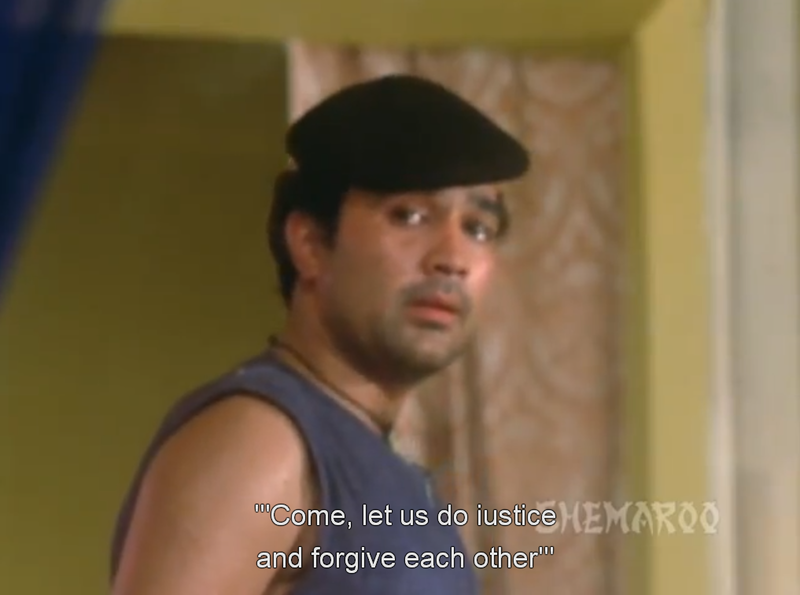 Darn-it, Hema. WHY couldn't you just be happy with your days spent in fab sixties lingerie reading the paper on the couch? Or gazing at the pillow your Shashi put under the covers to make you think he was still at home? Why aren't you happy with the barefoot and pregnant plan? 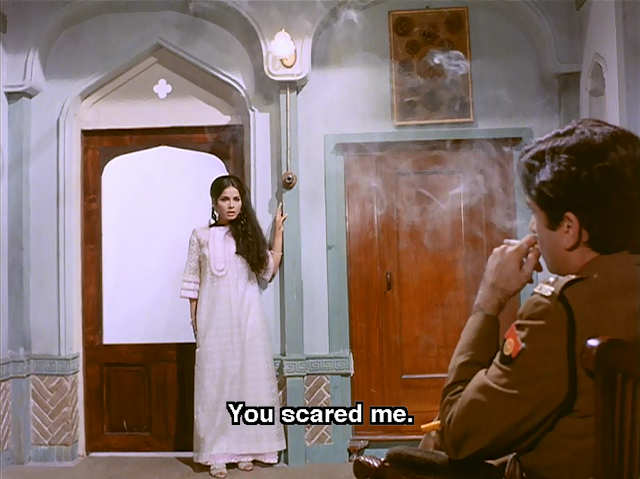 All because: (A) Shekar can't seem to focus on work and his wife (understandably--she's adorbs) and (B) because Anjana's energetic self gets tired of sitting around waiting for her husband to come home and decides to go back to the stage. Here's the thing, Shekar. I agree with the looking away part. I wasn't so much a fan of this dance either. 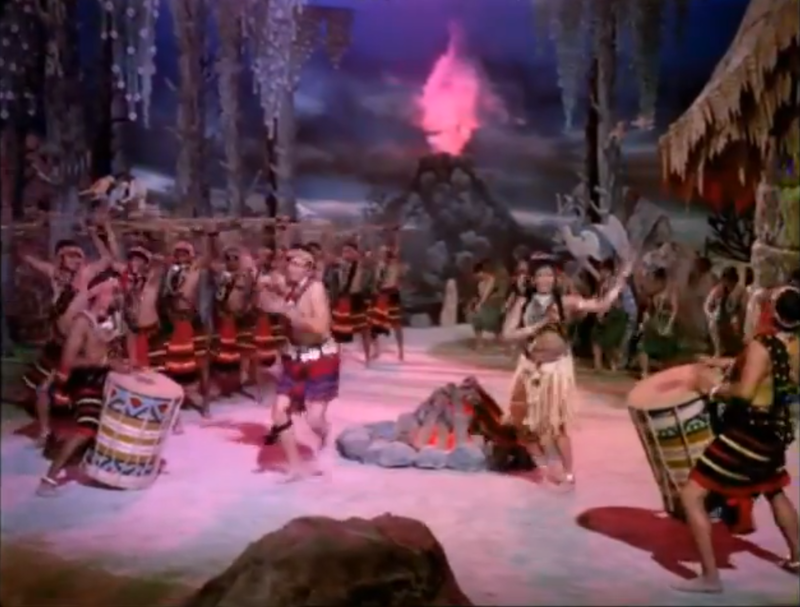 I mean, tribal-cave-volcano dances to pseudo-rock and roll in the space of 10 minutes? Kind of embarrassing. Plus, that prince-fellow was channeling Rudolph Valentino something fierce. Not something you want to have to compete with. 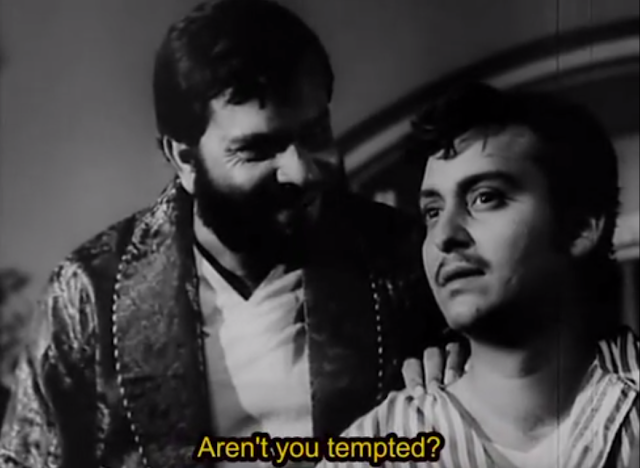 The film leads us to believe that Shekar's last straw is the male fan's "lewd" commentary about his wife after a performance. (As Bolly-Blogger Beth points out here, this particular bit is so close to Shakespeare Wallah's plot it's practically cannibalized.) But his motivations are murky. Is he jealous? Ashamed? Possessive? Probably all of the above. 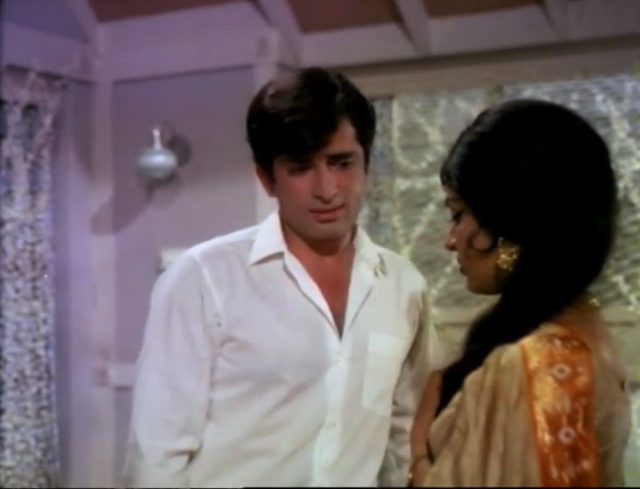 At first, when Shekar puts his foot down, Anjana puts her foot down too, and moves out. 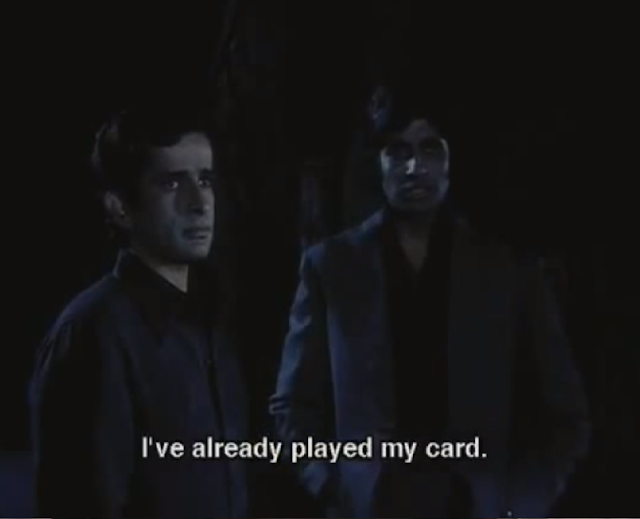 However, the film backs down and slides into convoluted ambiguity at the end. Shekar and Anjana choose to get back together, but without resolving the BIG question (as far as I can tell at least): Will Anjana still dance? 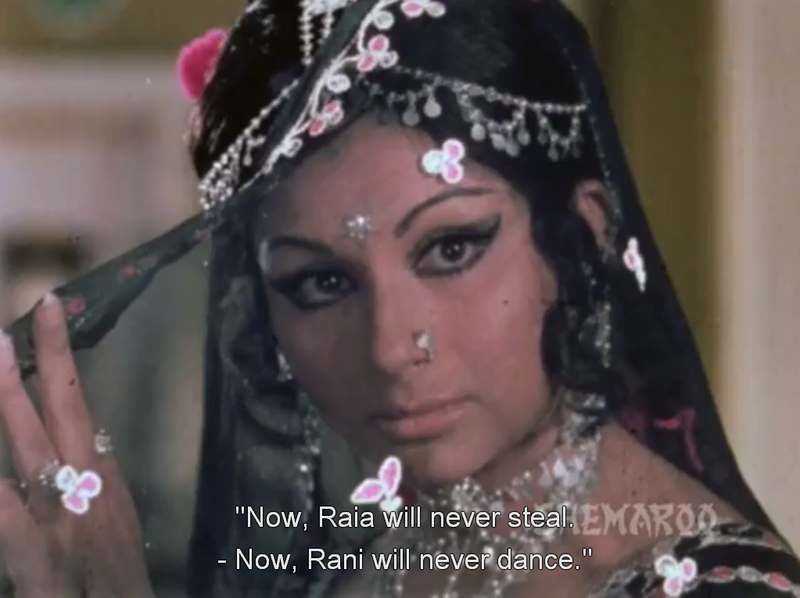 Will she give it up for Shekar's (and his Maa's) benefit again? You get the feeling that it could go either way. In Raja Rani, both members of the relationship want OUT. Doing what they are good at has brought them a lot of pain, and has always been a matter of survival rather than passion. And here, when both spouses find themselves forced to go back to their old ways, it is out of love for one another (and pesky survival again) that they choose to take that risk . . .
And because of their love, they forgive each other when their choices go south and cause pain again. However, even if they were able to bear one other's shame, that doesn't guarantee the ability to bear one another's success. If an inverted version of the situation were to take place--Raja and Rani running off in secret to do something they loved but getting caught--I'm pretty sure they would have also supported one another. But that's just speculation, and it might be argued that someone else's success (or joys or passion) is harder to live with than the same person's failure, however "beloved" they might be. So far, these examples all take place in the context of romantic relationships (although Emily and Dean were friends a dozen years before they became anything else), but I think the same reasons that cause a person in a romantic relationship to suppress the creative expression/inspiration of their beloved are ALSO present and active in common-place platonic and familial relationships. Friends don't want to lose their closeness, and so passively prevent one another from taking steps towards other passions . . . passions that might separate them eventually. Parents don't want their children to stray too far from the homestead, and so actively push them towards careers that are safe and practical enough to keep their heads out of the clouds and down among the family where they "belong." Older mentors feel threatened by their protege's youth--which equals for them a symbolic stream of possibilities that they have left behind forever--and subtly sabotage the protege's confidence. Then there's the person who out of discontent wants to live through someone else--vicariously--and so will advise a path that is closer to their own aptitudes and unfulfilled desires. Even fellow artists cannot necessarily be trusted to have another artist's success in mind. Peers, as the "character" of Hemingway in "Midnight in Paris" (2011) points out, are first and foremost competitors--and so will dislike a creative work (and may seek to suppress it) regardless of its merit. For Charulata, success did not prove sweet. Brother-in-law is impressed by her instant fame. But he also is intimidated, and their relationship begins to sour. Whether this is because he guesses her feelings for him, or because he's jealous, it's not really clear. Perhaps both? Given his ambitions, her casual treatment of her own skills and quick achievements might have been a hard pill to swallow. Whether it's jealousy, fear, misunderstanding, family duty, or societal pressure . . . the gifted writer or artist will always be surrounded by a crowd (many of whom may be loved ones) who will seek to undermine and derail their creative journey in either veiled or obvious ways. Right, because even though you read poetry all day long, you should try to be a lawyer. Yeah, that's going to work out. But this crowd of detractors doesn't let the aspiring writer or artist off the hook. For if the external pressure succeeds in extinguishing the creative flame (as it does for a while in Abhinetri and Emily's Quest and potentially in Charulata's life after her story ends), how strong was that spark of inspiration in the first place? I mean really? One could also ask, where did the inspiration come from? 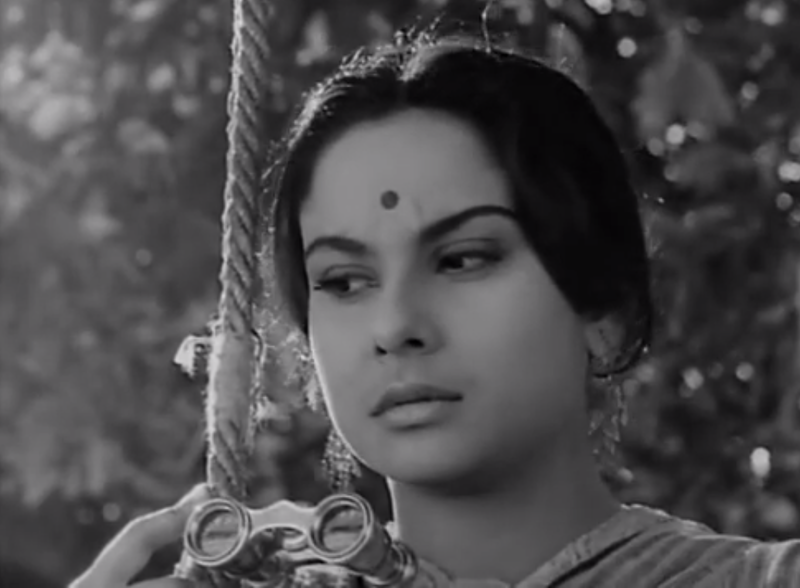 Did Charulata write because she was inspired from within? Or did she just want to show her budding (and impossible) crush that she could do something he valued better than he could? 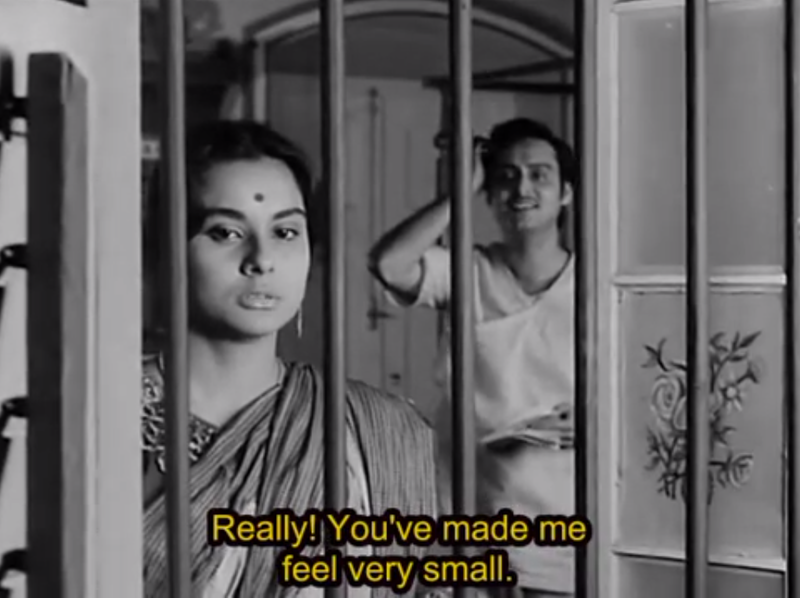 Without her favorite competitor around, Charulata's desire to write fizzled out completely. Which begs the question: Was she really a "writer?" Or was she just compelled to put pen to paper once because of a singular rejection? In the case of Montgomery's hopeful writer, Emily, the spark of inspiration did eventually return. She wrote again, and finally began to succeed. Her true love returns home, and she finds that he makes no claims on the territory of her art. Which is good, because although she could never her poor sacrificed story back, she COULD do something new. In fact, she had to, because she couldn't stop the stories from flowing out of her. Whether or not she would ever be published again, her writing would continue, regardless. I kind of hate to see dichotomies of Love vs. Art in personal relationships (on film or in real life), but nevertheless, where they exist, they DO serve to expose the artist's deepest motivations and drives. 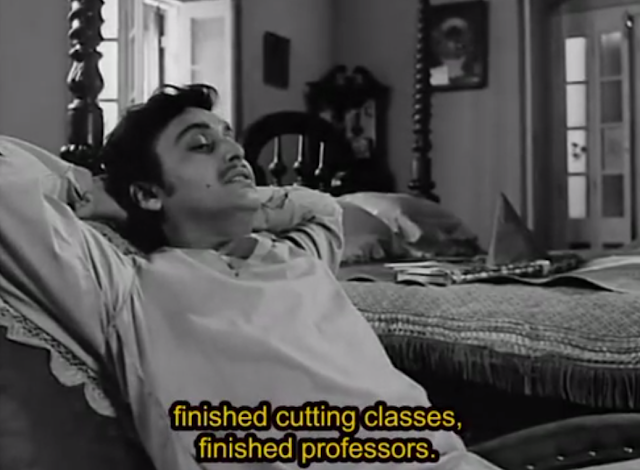 This is exactly why one can't feel too badly for Anjana or Charulata. (Or you could just pick a fight with the creators of their characters. Whichever you like.) For, if you only create when you are in love, are you really creating art? And if you are willing to sacrifice your art for love, are you really an artist at all? Perhaps true (or inwardly sparked) inspiration is indeed a runaway train, and can only be recognized in the wake of its unstoppable momentum . . . after it has left the gaping onlookers in a cloud of dust and disappeared into the distance.